In keeping with my constant grousing about the Western obsession with the influence of Classical and Renaissance art on subsequent periods in Western art history, I would like to focus on a period when Japanese art influenced American art (that influence is referred to in French as Japonisme). The US Navy forcibly opened Japan to trade with America in the 1850s, ending 200 years of Japanese isolation from foreigners (except for limited trade with the Dutch). Trade exposed American artists to the richness of Japanese art, which included porcelain, silk, painting, and printmaking. The Japanese color woodcuts were particularly influential on Western art, especially the artists of the late Ukiyo-e such as Hiroshige (1797-1858) and Hokusai (1760-1849), who were landscape specialists. We can definitely see the influence of Hiroshige in the work of Bertha Lum. Lum was born in Iowa and studied art at the School of the Art Institute from 1895 to 1900. At the time, printmaking enjoyed a renascence due largely to the influx of Japanese woodcut prints. The Arts and Crafts Movement – which emphasized the rejection of mass-produced in favor of handmade art – encouraged artists to design and carve their own wood block prints. Lum studied under Frank Holme (1868-1904), primarily a newspaper illustrator, who experimented with multi-block color woodcuts. When Lum married in 1903, she and her husband went to Japan on their honeymoon. While there, she was particularly impressed with the work of Hiroshige. Lum also spent much of her time in Japan looking for wood block printers. Before she returned to the US she bought tools for making prints and got basic information about how to use them. Back in the US she began producing wood block prints which she drew and cut herself. Her earliest prints were nostalgic scenes of Asia, primarily Chinese and Japanese in flavor. In 1907 Lum returned to Japan, this time with the intention of studying woodcut printing under established Japanese artists. Other American artists, such as Helen Hyde, were also in Japan studying the woodblock technique at a time when the popularity of the medium had dwindled in that country. Lum apprenticed to both an engraver and a printer, and had to study quite awhile before they would allow her to produce her own work. For many years after that she cut and printed her own work, but eventually employed assistants to do the actual printing. She was successful selling her prints in California. In 1922, after living in Japan again, she finally settled in Beijing, where she regularly exhibited her prints and paintings. She lived on an off in China until 1953 when she returned to the US for good. This composition by Lum is very reminiscent of the landscapes of Hiroshige. Especially similar is her use of positive and negative space, as well as the simulation of weather conditions. 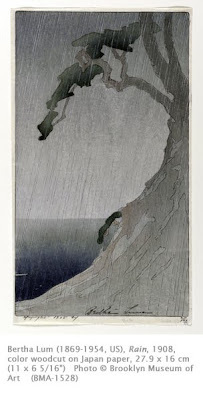 Hiroshige was known as a master of rain and snow scenes in his woodblock prints, and Lum’s work admirably mirrors the influence of those works. A Google search for Lum’s name comes up with a nice selection of her beautiful prints. The Hanga Gallery that handles prints by Lum. Learn more about Japanese Ukiyo-e prints in my post about Hiroshige. I will now continue to "travel" on your blog.